WHY DO WE GIVE NASI LEMAK AYAM ? 1. It is filling and easy to pack and our makcik do a good job with it! 5. RM3 is a good price that we can afford to pay for a full meal of hot food . Firstly many many thanks to the kind souls who have donated so far to our Nasi Lemak Ayam campaign for our street people. 1. For this campaign you may either donated directly as per our Reach Out Bank Account, (and Reach Out will distribute according to our operating days and the needs on the street), or you may purchase at our supplier. 2. If you wish to purchase at our supplier we need to know in advance on what day you wish to purchase/the amount you wish to purchase. We will then meet you on that day or days you have chosen at our supplier and assist you in the purchase. 3. We distribute all hot food within two hours of purchase to ensure freshness to our street friends. 4. Each day we operate we coordinate the amount of food and also the number of volunteers. Apart from the hot food we also supply water and biscuits, hence the reason we need to know how many packs of hot food are going onto the street each day. 5. We also use a dedicated supplier as we can ensure the food is halal and also that the suppliers profits go to supporting orphanages in Aceh for children of the tsunami. Hope this clarifies a little confusion over the last 24 hours. Once again, many many thanks for what you are doing to support us in our help for the poor. TOTAL TO DATE AS AT 5/11/11 – IS 2312 NASI LEMAK AYAM (50% of target). 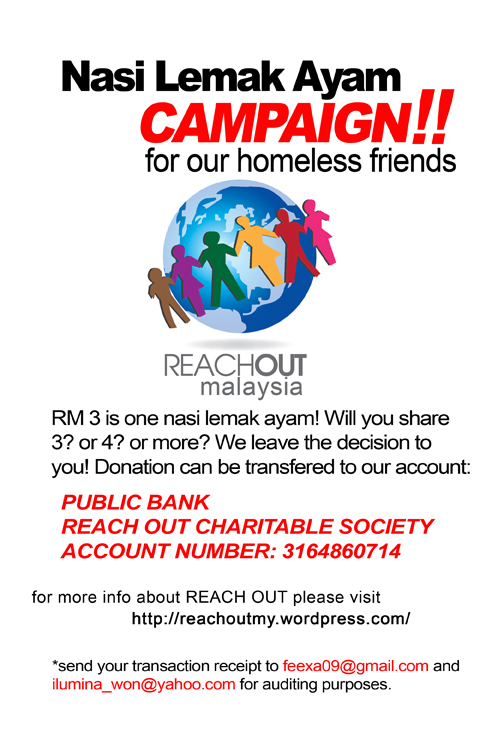 TOTAL TO DATE AS AT 8/11/11 – IS 3709 NASI LEMAK AYAM (75% of target).